Although there has been a significant increase in research and clinical studies related to children and with autism spectrum disorders (ASD), we have only recently begun to appreciate the complex challenges faced by adults who were not identified in childhood and are presently an underserved population. 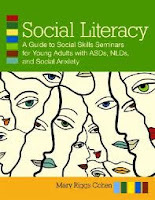 Social Literacy: A Social Skills Seminar for Young Adults with ASDs, NLDs, and Social Anxiety by Mary Riggs Cohen is a book and CD set that provide an evidence-based social skills curriculum for more capable young adults with social learning needs and life transition issues (e.g., college, work, interpersonal relationships). The Social Skills Seminar incorporates the basic principles of cognitive behavioral therapy (CBT) with the overarching goal of developing social and communicative competency through direct teaching, modeling, coaching, role-playing, and practice activities. The book covers the background and structure for conducting a social skills training course over a 12-week period, meeting once each week for 3-hour class sessions. Beginning with an introduction, the author takes the reader through a discussion of the neurobiology of social learning disorders and the theoretical foundations of program design. Subsequent chapters include the selection, training, and use of social coaches, understanding of nonverbal communication, improving conversational skills, interpersonal relationships and dating, and employment issues and interviewing skills. A template is provided for each class and includes objectives, exercises, and applicable handouts. The final chapters describe efficacy studies of social skills training and practical applications. Perhaps the most impressive feature of the seminar is the use of social coaches to enhance generalization to real world situations by engaging participants in experiential opportunities. Each participant is assigned an individual coach who provides feedback and support during the 12-week course. Chapter 3 of the book provides a description of the social coach selection process, a critical step that takes place prior to initiation of the program with participants. The accompanying CD-ROM contains PowerPoint slides that provide a sequential format to the instructional portion of the class. Photocopiable handouts used in the class lessons are also included. As noted in the text, social coaches are an integral part of the seminar. Slides for preparing social coaches are included on the CD and provide essential training on social learning disorders, outcome measures, curriculum topics, and coaching activities. At present, there is a paucity of information about the educational and employment outcomes for more capable adults on the autism spectrum. This includes those in the general population who do not meet the threshold for a diagnosis but whose social problems impact their personal and social lives. However, it is clear that outcome depends to a large degree on the level and appropriateness of support provided to the individual. Social Literacy is the most comprehensive and evidence-based framework currently available for planning and executing a meaningful and effective social skills training program for young adults with social learning challenges. The program is designed to be flexible and can be adapted and modified to accommodate the specific needs of the participants. The publication of Social Literacy also provides an opportunity for researchers to investigate the effectiveness of social skills training in adult populations. I highly recommend this social learning course to professionals in private practice, secondary schools, colleges and universities, and community settings who work with young adults to help them navigate the social environment and achieve a successful transition to this stage of life. Cohen, Mary Riggs (2011). 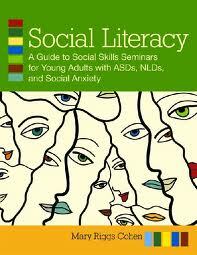 Social literacy: A social skills seminar for young adults with ASDs, NLDs, and social anxiety. 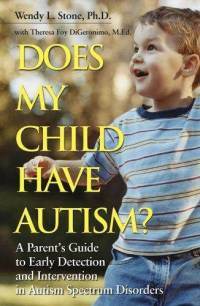 Baltimore, MD: Paul H. Brookes Publishing Co.
Best Practice Book Review: Does My Child Have Autism? Does My Child Have Autism? authored by Wendy Stone emphasizes the critical importance of early identification and intervention for young children with autism spectrum disorders (ASD). This comprehensive and accessible book provides much needed assistance to parents in identifying the early warning signs of autism, understanding the diagnostic process, and identifying scientifically validated interventions and treatments. The author also provides practical suggestions, activities, and teaching techniques that can be used to improve social, communication, and play skills at home. Frequently asked questions are included at the end of each chapter to address common issues and questions often asked by parents. An Appendix provides a listing of resources for further information. Although the author suggests that the book was written primarily for parents, clinicians, and educators, experienced autism professionals will find it to be a valuable resource as well. This book will also make a welcome addition to one's professional and lending library. Despite significant changes in the field of autism over the past several years, Does My Child Have Autism? continues to be an important text and one I highly recommend to both parents and professionals. Stone, W. L. (2006). Does my child have autism: A parent’s guide to early detection and intervention in autism spectrum disorders. San Francisco, CA: Jossey-Bass. Autism is variously viewed as a psychiatric disorder, mental disorder, and mental disability by the Diagnostic and Statistical Manual of Mental Disorders (American Psychiatric Association [APA], 1994) and International Classification of Diseases (World Health Organization, 1993). The requirements for all disorders in the DSM-IV are "evidence" of personal distress, functional impairment, or contribution to personal risk of loss. The boundary between normality (or typicality) and pathology is conceptualized as a “clinically” significant behavioral or psychological syndrome that occurs within an individual and is associated with a disability (or impairment in one or more areas of functioning). The clinician’s task in using the DSM classification system is to determine whether the problems presented by the individual can be reasonably conceptualized as a mental "disorder" within this context. The pervasive developmental disorders (PDD) have traditionally been viewed as categorical rather than dimensional systems of classification (diagnoses). With a categorical or dichotomous scheme, disorders are either present or absent (e.g., an individual meets or does not meet criteria). For example, the DSM-IV-TR and ICD-10 list specific criteria for each disorder that must be met to receive a diagnostic classification. They both focus on a description of behavior rather than its function. Researchers and practitioners now posit that autism falls on a continuum and that there is no clear distinction between “mild autism” and the boundaries of neurotypicality (or normalcy). In fact, we now recognize that autism-related traits are normally distributed throughout the general population and that autism is best conceptualized as a spectrum of severity. As Lorna Wing comments, “All of the features that characterize Asperger syndrome can be found in varying degrees in the normal population.” According to the extant literature, the accepted terminology is to use autism spectrum disorder or the acronym ASD as an umbrella term to describe individuals with Asperger’s Disorder (Syndrome), high-functioning autism (HFA), and PDD-NOS. Nevertheless, experts such as Baron-Cohen (2008) contend that the term autism spectrum condition (ASC) is preferable to ASD as this term concurrently recognizes both the disabling aspects of autism and a profile of strengths (e.g., non-social skills). As with any “condition,” an autism spectrum condition may or may not be disabling. This includes groups of more successful individuals in the general population who present with sub-clinical (or sub-threshold) features of ASD. While individuals who have autistic traits certainly think and perceive differently than typical individuals, they may not be significantly impaired. An individual may demonstrate mild qualitative differences in social skills, yet not meet the clinical criteria for an autism-related condition such as high-functioning autism or Asperger’s disorder (syndrome). While a person’s social skills might be below average relative to his or her age group, these differences may not result in what might be considered to be a “global” disability or impairment. Moreover, there are individuals without a diagnosis who have marked difficulties, while others with a diagnosis have only mild problems. Despite the considerable variation in the profiles of individuals with autism, it is when these “differences” in social functioning lead to an impairment in adaptability (e.g., personal, occupational) and the need for clinical services, that we describe the individual as having a disorder. This includes the commonly co-occurring (or comorbid) disorders such as anxiety and depression. So, we return to the question, Disorder or Condition? It would seem that the term “condition” is more compatible with the dimensional view of autism. It reflects the assumption that autistic traits exist on a continuum and that they are normally distributed throughout the general population (e.g., we all have some autistic traits). Using the term autism spectrum condition (ASC) also communicates a “value-free” or neutral perception as opposed to the negative impression associated with disorder or disability. Lastly, the term condition acknowledges that individuals with ASC may also possess positive traits, thus encouraging a strength-based perspective.